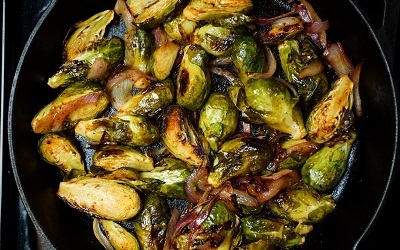 In a large bowl, mix together brussel sprouts, onions, olive oil and Slap Ya Mama Low Sodium Blend Seasoning. Spread evenly into an oven safe skillet or baking sheet. Roast for 25 to 30 minutes, stirring only once. The brussel sprouts should be tender and slightly browned. Remove from heat. In a small bowl, mix together balsamic vinegar, honey and creole mustard. Drizzle over roasted brussels sprouts and gently mix.